The kit allows for BARs, Thompsons, Grease guns, 1911s. 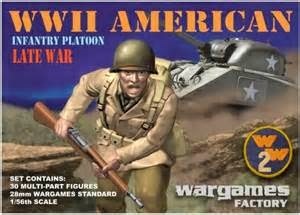 The terrible box art appears that the men are wearing the tan jackets from earlier US uniforms. Speaking ofBaconfat, here are three 20mm pigs on integral bases. So Baconfat has an early lead in points with 62 points! I see Bacon has pulled their fat out of the fire and now I fully expect Baconfat to pull through and win the challenge. Next week will be some Perry Burgundian Mercenaries.